Updated plugin for opening RAW images from DSLR cameras. Starlight-Xpress Trius SX-56 and Trius SX-46. Updated development kit for creating custom plugins. Starlight-xpress Trius and SXV/SXVR "H" version 3.0. Moravian Instruments, updated Astroart driver version 2.2. Updated ASCOM 2.10, SBIG 5.40, Starlight-Xpress Lodestar 1/X2 2.00. 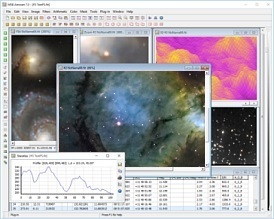 A complete software for astrophotography: image processing, astrometry, photometry, camera and telescope control. All major cameras, telescopes, filter wheels and focusers are supported by Astroart. Updated plugins are released for free. Astroart is also an open system with plug-in support and free development kit for C++, C#, Pascal, Visual Basic. Fully compatible from Windows XP to Windows 10. Adaptive denoise, maximum entropy deconvolution, hot pixel removal, adaptive remove gradient, comet enhancement, unsharp mask, deblooming, DDP, FFT, masks, etc. with realtime preview. with integrated star atlas. Batch photometry, aperture photometry, plate solving, MPC reports, user annotations. Fast and precise on sets of images. Several algorithms for every situation (star fields, comets, planets, spectrums, etc). Native 96 bit (32 bit for each color plane), visualized in real time without modifying the underlying data. Realtime debayering, LRGB combine, adaptive saturation, realtime color balance and color curves. Complete camera and telescope control. Scripts for automatic research and observatory automation, centering via plate solving, shortest-path telescope sequences. Astroart is an extremely fast software thanks to its code optimized in SSE assembly. It can align and stack hundreds of images quickly and offers realtime preview on most filters. A demo version of Astroart is available at the download page. Copyright (c) 1998-2019 MSB Software. All rights reserved.